Featuring a 1.0-inch 4K UHD CMOS image sensor and dual DIGIC DV 6 Image Processors, the XF705 can record 4K UHD video up to 60p, as well as slow motion recording up to 120fps in Full HD. 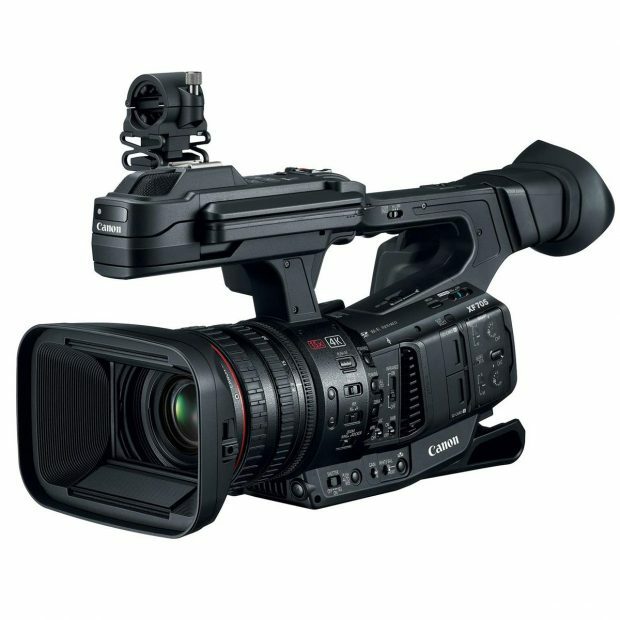 The XF705 is also the first Canon camcorder to adopt the H.265/HEVC codec, which improves the efficiency of 4K data handling. The XF705 supports the Hybrid Log Gamma (HLG) and Perceptual Quantization (PQ) HDR formats, which offer a much greater range from black to pure white, and an HLG/PQ shooting assist mode helps users record HDR video using their usual shooting methods. A 15x optical zoom lens incorporates a 5-axis optical image stabilization system, and maintains 4K UHD quality throughout the entire zoom range, while the camcorder’s Dual Pixel CMOS AF helps facilitate fast and accurate autofocus. The XF705 includes an HDMI 2.0 terminal with 4K UHD output support, two XLR terminals with independent audio level control and a 12G-SDI output, which features four times the transmission speed of 3G-SDI, helping to facilitate seamless integration into professional 4K UHD workflows. An adjustable 4.0-inch touch panel LCD monitor and a built-in 0.46-inch electronic viewfinder enhance usability, helping you to shoot in a variety of shooting situations. Canon Log 3 provides post production flexibility while IP Live Streaming capability furthers broadcast possibilities. Designed to meet the needs of professionals, the XF705 offers a wide range of recording possibilities. Previous Previous post: Canon EOS R & New Lenses Full Pre-order Links Now Live ! Next Next post: Profoto B10 AirTTL Officially Announced !